This June at AUTOMATICA 2018, while unveiling its new lineup of adaptive grippers for cobots—Hand-E, 2F-85 and the 2F-140—Robotiq was also celebrating 10, 100, and 10,000. Specifically, the trio of numbers refers to the 10th anniversary of the company’s founding, the onboarding of its 100th employee, and the sale of its 10,000th gripper. Noteworthy numbers to mark the company’s first decade. Impressive stats, but to Sam Bouchard, co-founder and CEO of Robotiq, the most impressive milestone was and still remains, number 1: Robotiq’s very first customer. A first-customer experience that ten years on still has a lot of bearing on the company’s engineering. Bouchard says he sold the company’s first gripper in Detroit to an auto parts supplier. As he tells the story, he was ecstatic with the sale and the validation that the gripper’s engineering and quality were valued additions to the end-user’s operation, and that the price was right. On the long, slippery drive home to Quebec over icy roads, he says there was plenty of time to reflect on the importance of customers, and how every product must meet those same criteria of engineering, utility and price. On display at the company’s AUTOMATICA trade show booth were the latest customer-influenced products: Robotiq’s newly-released adaptive grippers. Over the intervening ten years, Bouchard says that Robotiq has never strayed from its customer focus. If anything, it’s gone even deeper. A quick trip to Robotiq’s website displays a well-stocked showcase of customer commitment: Dozens of free instructional eBooks, how-to videos, an online forum for the developer community; plus easy, quick-click access to the company’s experts; Lean Robotics, which is a Bouchard-authored 200-page how-to guide on factory productivity; and then there’s Blueprints, which is a free, online service whereby Robotiq helps any manufacturer, big or small, to design and transform an existing manual process into a robotic cell. 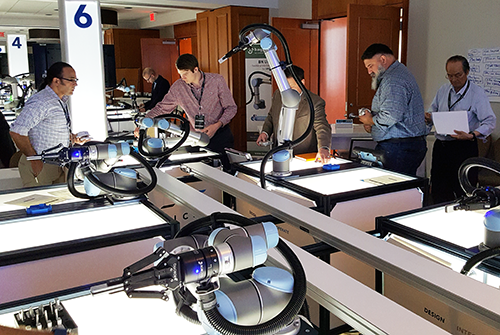 At last year’s Robotiq User Conference, the company transformed a fancy hotel ballroom into a factory floor of eight work stations of five robots each; a total of forty robots tasked with eight differing assembly operations. Conference attendees were recruited to role-play customers transforming each of the eight different manual processes into eight, multi-cobot work cells. Some might look at the intensity of Robotiq’s customer-centric outreach as being a bit overboard, however, one stroll around AUTOMATICA 2018 quickly showed the reason why: Competition! It’s ferocious, and with cobot sales headed into the stratosphere at least through 2025, gripper developers for all those cobots—and there are some two dozen gripper manufacturers worldwide—are going full bore to quickly secure market share. AUTOMATICA 2018 was a good gauge of what’s in store for global gripper developers: 1. Increased competition as ever more gripper manufacturers set up shop, seemingly on daily basis; and 2. Competitive engineering as the range and array of gripper types, functions and capabilities rapidly expand. Differentiating a company’s engineering and products to the marketplace is critical, but for Robotiq, equally important is educating potential customers and showing them how to best select a product and then how to best use that tool to automate production. Helping potential customers to fully understand and to sort through all the cobot and gripper combinations is a major but necessary undertaking. It’s especially important for SMEs, who for the most part are first-time cobot buyers. Rookies! SMEs by the tens of thousands are looking to transform manual production processes into more productive robotic cells. Knowing exactly what they are buying and how best to get the job done with a cobot/gripper combination is essential. No SME wants to make a mistake…mistakes are expensive! Robotiq’s long-standing customer orientation and its website chock full of how-tos and online hand-holding are real difference makers when it comes to making buyers knowledgeable. Even post-sale, Robotiq stays customer-close with yet another downloadable app, Insights, which as the company website explains, sends a customer a text message whenever “your robot requires your attention, and provides real-time data to monitor, troubleshoot and improve your production.” Such online help has become a standard offering for major robot manufacturers and their end users, however, with Insights, Robotiq has customized its predictive analytics for every customer large or small. Robotiq’s product design and engineering decisions are also a direct result of the company’s customer experience and interactions. There’s a decade of automation experience driving every design decision. From Bouchard’s observations, next steps at iterating his product line meant more flexibility and increased precision, which resulted in the engineering direction that culminated in Robotiq’s new line of adaptive grippers: Hand-E, 2F-85 and the 2F-140. The end goal for flexibility, he says, is to optimize the toolbox. That observation resulted in the new Hand-E electric gripper’s multiple-function capabilities, like machine tending, pick and place, precision assembly, insertion or finishing. All from a single gripper. Enhancing the new line of adaptive gripper capabilities is their easy integration with modular add-ons like the Robotiq Wrist Camera and the FT 300 Force Torque Sensor, for pick and place or tending a CNC machine. Optimizing the toolbox also found its way into Hand-E’s sleek rack housing that is sealed from harsh operating conditions, while its ergonomic shape makes it easier to move and position. Robotiq’s adaptive grippers also integrate seamlessly with cobot arms from the global leader in cobotics, Universal Robots, and its recently announced line of improved cobots, the e-Series: UR10e, UR5e, and the UR3e. At AUTOMATICA, Hand-E was also seen attached to AUBO’s i5. With demand for cobots expected to rise by more than 50 percent over the next decade, the need for grippers for every one of them will escalate as well. However, with over forty cobot manufacturers and nearly two dozen gripper makers plying their products across the marketplace, most will probably not last the decade. If innovative engineering, high-quality craftsmanship, and a laser focus on customer needs are the hallmarks of those who will prosper over the next ten years, then Robotiq will definitely get to celebrate its 20th anniversary at AUTOMATICA 2028. Cobot integrations: Universal Robots e-Series (UR10e, UR5e, and UR3e); as well as with AUBO i5.